Depending on the steam generator operating pressure, we have either low pressure ( LP ), medium pressure ( MP ) or high pressure ( HP ) boilers. Table 15 provides the usual lines separating each category. 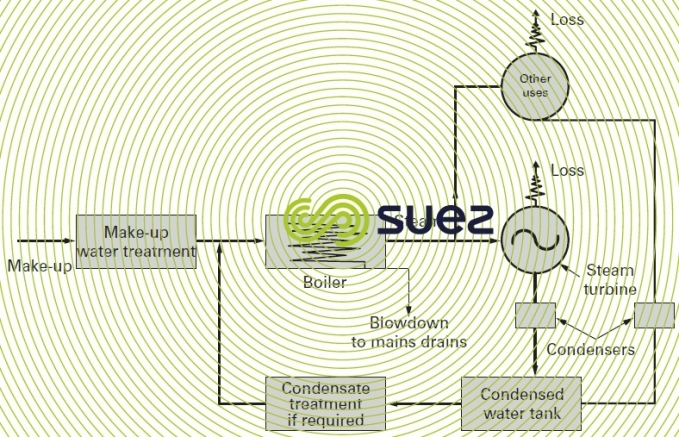 Regardless of the type of boiler considered, the water cycle can be illustrated very simply by the following diagram (figure 14). The unit receives feed water that consists of a variable proportion of condensate also desginated "return water" and more or less purified new water called "make up water". The vapor that escapes from the vaporisation zone often contains liquid gas inclusions (priming) (especially carbon dioxide). Under high pressures, it will carry salts that have been volatised by actually being "entrained in the vapor". These salts will include silica and, at extremely high temperatures, chlorides. The water that has remained as a liquid in the lower part of the boiler becomes charged with all the substances carried by the water that has been vaporised (with the exception of those substances that had been entrained in the vapor). The deconcentration that is required is termed "blowdown" or "extraction" and it returns a fraction of this water to the drains. When the boiler is operating continuously and if, for simplification purposes, we accept that the salinity entrained in the vapor is negligible, the concentrations achieve a stable equilibrium when the mass of the salts removed with the discharge to the drains is equal to the mass of the salts added by the make-up water (because condensed water is deemed to be pure). Therefore, we tend to increase this rate in order to limit sampling. However, this step has to be undertaken within acceptable financial limits. corrosion of extremely varied nature and origins due to either the action of dissolved oxygen or by the medium’s acidity caused by carbon dioxide in particular, or yet again to iron being attacked direct by water. Before considering any remedial means, we must examine the level of the various hazardous elements that have to be observed in the liquid phase depending on boiler and, if applicable, turbine characteristics. The relevant figures to be met by make-up water have been established on the basis of on these figures and on allowances made for the extraction possibilities presented by blowdowns. We have found that the lower the blowdown rate (and, therefore, the higher the salinity in the boiler), the greater the difficulties associated with the four problems examined above become. These disadvantages as well as the methods to resolve them are explained in more detail in chapter treatment and conditioning of industrial water. 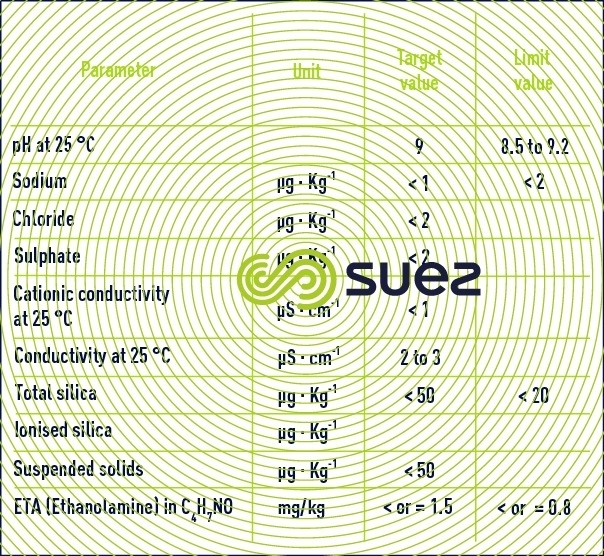 We give below an extract taken from draft European standards on tube boilers and fired tube boilers that define the limit contents applicable to impurities causing the most problems: Iron, Copper, Silica (deposits), Ca, Mg (scaling) and conductivity, all ionised salts (corrosion, steam quality). 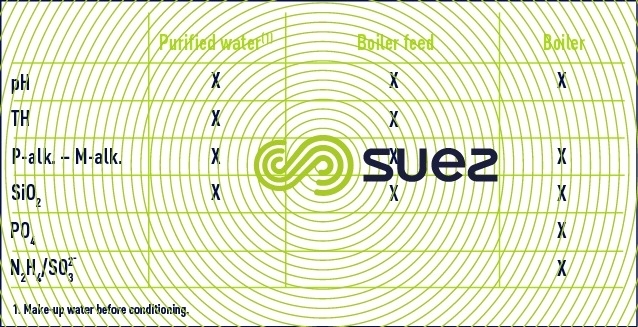 Feed water for steam boilers (except injection water for desuperheaters) and superheated water boilers (table 16). 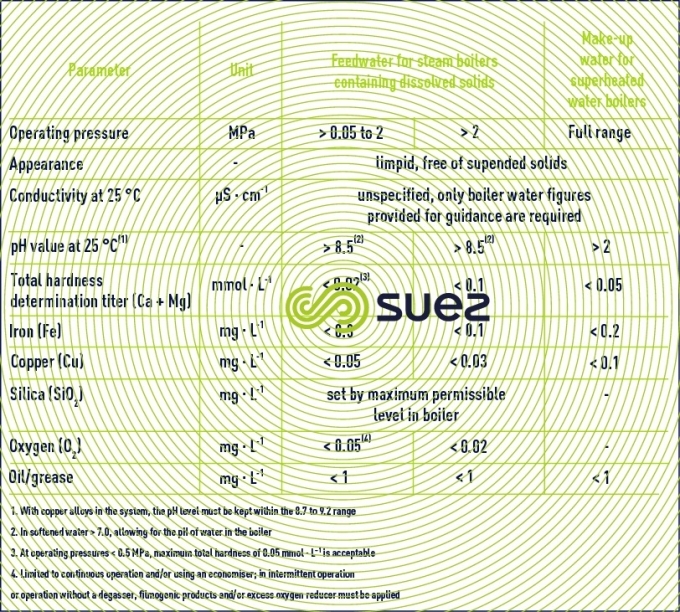 Feedwater for natural or assisted circulation steam or superheated water generators (table 17). With the development of automated control systems for boiler plants, manual control can be restricted to the following elements (once daily under normal operating conditions) (table 18). Some generators used in nuclear power stations have neither a chamber nor extraction facilities. Thus, any impurities dissolved in the feedwater will finish up on the evaporation surfaces or in the steam. Consequently, it is imperative that foreign substances found in the water be restricted to acceptable limits in the steam. This applies to all conventional boilers in the "forced circulation" category or to boilers used in the chemical industries and designated "recovery boilers" that can be identified by the absence of a chamber and by permanent deconcentration blowdown. Some gas turbines use the water or vapor injection technology with a view to increasing efficiency and/or reduce combustion temperature in order to achieve a major reduction of Nox in flue gases. Therefore, in order to avoid corrosion of the hot sections and the formation of deposits, the demineralised water used must have a low impurities content: in general, conductivity of less than 1 µS·cm–1 and a silica level of less than 0.1 mg·L–1 will be required. All dissolved salts and especially silica must be reduced as much as possible for these very sophisticated boilers. These extremely stringent conditions have been set by the boilermakers themselves who must always be consulted. corrosion products created by an oxygen intake. If necessary, these impurities must be processed before being returned to the boiler (see condensate treatment, chapters using ion exchangers and treatment and conditioning of industrial water). the secondary circuit responsible for vaporisation and that comprises the turbine, condensor and, if applicable, condensate processing, heaters and supply pump; this circuit only becomes active in the event of a leak from the generator. 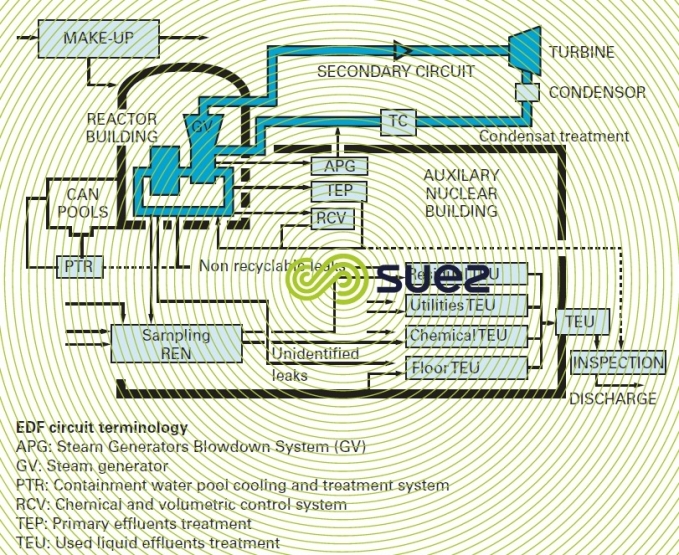 In the primary circuit, water is kept in its liquid state at a pressure of approximately 150 bar for a reactor outlet temperature of approximately 320°C (return temperature of 280°C). Corrosion must be comprehensively controlled in both circuits and, therefore, the water conveyed through these circuits must meet stringent requirements. boric acid that acts as a neutral stream moderator and is used to regulate the power supplied by the reactor. 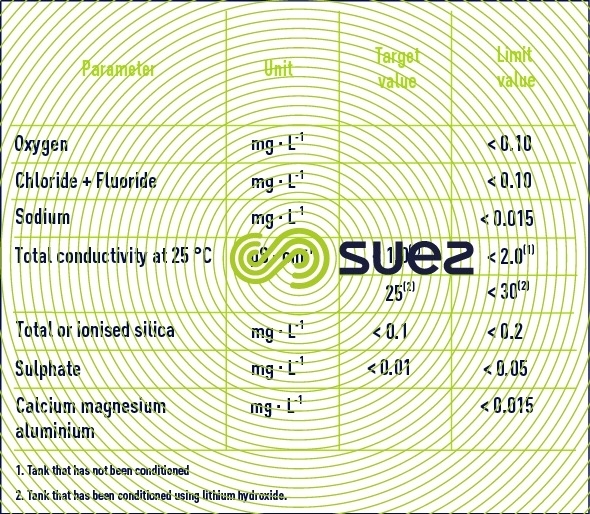 Primary circuit make-up water: table 19 details the recommended and limit values applicable. Circulation time is in the region of one minute. Various radioactive impurities caused by leaks from fuel ducts or by the activation of corrosion products may accumulate in the pressurised water. That is why several by-pass purification circuits are installed on the primary circuit loop. 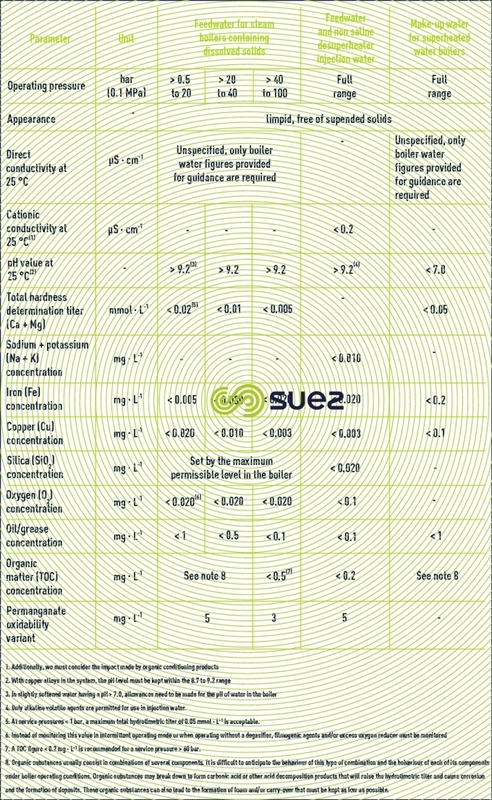 Table 20 details secondary circuit make-up water qualities (conditioned demineralised water).